Although noise music has only recently become an object of interest for academic research, it still represents a form of art emblematic of the underground music scene. It is characterized by a radical approach which implies using noise as work material, playing with form and development, and hybridizing its stylistic territories. This approach is reflected by playing practices in which the emphasis is no longer laid on the supremacy of instruments and composition, but rather on playful and makeshift experimentation. Musical quality is not assessed on the artist’s technical skills anymore, while the listening conditions call for a specific implication of both body and environment. The practices of production, organization, and diffusion of music, borrowing from the éthos of DIY, place autonomy, versatility, and amateurism at the heart of this art world. This PhD research, based on musical analyses, press archives, field surveys, topographies, and an ethnographic study of the Parisian scene, proposes an interdisciplinary approach marked by musicology, aesthetics, and social sciences. Its aim is to question the way noise music and its specific social practices challenge the manner in which we conventionally apprehend what we consider as music, and even “good” music, the image of the musician, the artistic intermediaries or the stage, in light of what seems to constitute a new contemporary paradigm of experimentation. Sounds super difficult!!! I'm guessing all these things were spoken like avant-garde poem reading and your friend would knock things off of tables from time to time to add some noises? Afternoon and happy December, Mayuko, Fred, and all! Saturdays are natural for cartoon sounds! Good follow-up to Amanda's kids' show, too! @james Oh yeah! I should follow her show with music for all the happy adults with miserable childhood!!! @fred nice! the noise scene does seem to often have a strong sense of community, and those little communities all over the world are often well-connected with each other internationally. I always liked that about the noise/experimental music. Hello Mayuko and those without ear defenders. Just swanning around on this damp, dismal day. @fred like the use of the word 'playful'. Essential. @Brian People without ear defenders! That's indeed my listenerds! Thanks for tuning in! We're commenting en español? I'm having enough trouble with inglés. Upbeat glitch-dance musica is helping though. My "studio" is almost back to being set up so hopefully I will begin working on my experimental birthday song soon! @Mayuko: Mi es frio. Mi es bueno. DG, a song for experimental birthdays? Hello, Mayuko---I'm waving from a giant swan-shaped pedal boat in the Bay of Fundy today! Hello, Vertigo guys and gals, and all. Doing laundry but outside in the sun because I can’t stand these dark days. @rw Si, inglés es malo. If I get it done I will of course share it. @Dropof aw that's wonderful! Listenerd Joe B's tradition of DYI experimental bday songs now taken over! Mayuko, one of our daughters wants a copy of Essential Kanji for Christmas. @Sem Wow, sounds like you're having a great time except just a little cold?!?! Thank you for tuning in!!! 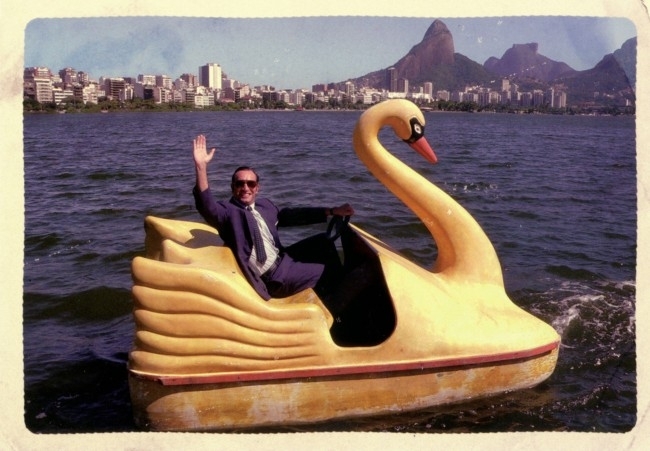 I love it when an adult taking a swan boat solo. I hoping several Listenerds go for it too! Would be fun. @Jake I thought the duck was doing great and not being bullied by other local ducks. But I guess now that he gets all the attention, of course he'd have some haters too. @Sem, Mayuko did not say 'a grown up'!! Joe's done an experimental birthday song? fred, it's okay. ¡Hola! Beunos días listernerds. Por favor haz muchas canciones de cumpleaños experimentales. Mayoko, s'funny I thought the OMitD sounded like Big Audio Dynamite, then Moroder's album has the same title as BAD's greatest hit. Maybe it is not funny. Brian, does she watch Japanese cartoons (I forget what the genre is called)? I know of at least a couple kids who learned Japanese that way. @Brian Maybe I should get that for myself for Christmas too. My kanji ability has become pretty disastrous. @fred your comment made me literally lol. Hi Mayuko - I got my poster, thanks a lot! Man, you California listenerds can handle Spanish so well of course. The Spanish lessons I've taken have not advanced any more than buncha manzana talks yet!! @rw she does admire Studio Ghibli's output. Hola Henry! I'm assuming I cannot pronounce H of your name today. Enry! @rw Bien, muy bien. @Mayuko Google translate es mi amigo. Other daughter is trying to learn Spanish (well South American) via Skype from a Colombian living in Germany. I'm lost. @Jose B Ah! haha! Bienvenido a mi radio! Brian, my daughter is a fan of that stuff too. She's got tree spirit stickers on the back window of her car. Hope you guys have a happy Christmas! And I need to check out now. ¡Gracias Mayuko para la musica feliz! ¡Hasta la vista Jose y los listenerds! ¡Yo soy Enrique! Yo tomo frijoles soy. ¡Fuera Yanquis! Gracias rw! Hasta la vista! Enjoying the dance party today!! @james at the end of the day, dance music is the best. I just flooded the lab so I'm dancing with my mop! @Ike: So nice to have you here again, where have you been? Swan Boats always remind me of a (possibly apocryphal) story George Harrison and Eric Clapton are sitting in the record companies office hashing out the contractually obligated song Badge when Ringo Starr walks in and starts talking about swan boats. Harrison & Clapton look at each other and say: that is going in this song. Once or twice, I’ve compared the dubbed version of a Ghibli film to the subtitled version, and found surprisingly I preferred the dubbed version. Normally I prefer subtitles. I don’t know any Japanese obviously, but the dubs of those movies always have great voices and the translations are smoother in English (though maybe not as accurate? IDK). @rw best wishes to you too. Yay to happiness in this season and to deriving joy from an orderly closet or any other small bit of order in one's life! I have a pen, I have a apple! PPAP! Ha! I wish I'd kept up my Spanish. It was really coming along in senior year of high school; I could follow lots of my Cuban American friends' parents' rapid-fire conversational lingo, and a lot of the Spanish channels in the NYC area. Then I placed highly enough on the Advanced Placement exam to skip language in college, and over the high school-to-college summer my skills diminished to sub-Sesame Street level. Decades ago, my Spanish classes started with a bizarre-o irregular verb, “gustar” — terrible idea! So then everybody tried to use “me” w/all the verbs instead of “yo”. That guy had no business teaching Spanish. The Spanish I have is mostly by osmosis. I once had to admonish a bus seat mate once not to be using his cell phone with whatever I could put together out of the words that might have worked! Ah, eh, ee, oh uh. Arbolito del Peru. Yo me llama, Jack. Comps te llamas tu? Mi favorite jugador de biesball es Fernando Venezuela. That is what I remember from junior high school Spanish class. Yes Mayuko, my music studio. I'm still recovering from my move. I'm hoping to have my synths and assorted gadgets all hooked back up in the next couple of weeks. I can't wait! @paul b Why did Ringo start talking about swan boats? Although I can clearly picture him in a swan boat solo and part of me thinks of course he would talk about swan boats. @fred Unless something kafkaesque thing happens to you. And if it happens to happen in Germany. @fred: of course I would have to go Babelfish and enter "ich bin ein papagei"
I took German lessons for about a month and wound up w/ a Bavarian accent but no understanding whatever of the language. @james I'd call it a huge success for myself when I get to Sub-Sesame Street level from this all-manzanas level. It's a bummer that it takes so long to learn a language, and yet you can forget it in a very short time! Mi nombre es Jack. Mi vivir en la ciudad de Nueva York. @Ike this Manzanas-app I'm using seems to be doing much better than el gustar hombre! Conversely, it's kind of neat to be in Tijuana and the only English to be found is in a liquor store where there's a shelf with a sign reading "¡With the worm!" @Ken Everything else doesn't really matter but we do need to know and be prepared if there's a worm in our drink!!!!!! I took 4 years of Italian in HS and years later when I went to Italy, I knew just enough to make a total fool of myself. Exposure to a steady stream. I like the sound of that! @Dropof I've gone through many years of feeling like a complete fool not knowing how to speak in an English-speaking country, I dunno why I'm about to put myself in that position all over again! But I guess it's inevitable when learning a new language... and it's also kind of fun. Hola, david! How do you do that? Not pronounce vowels? Yes it is fun! I was pretty good with Italian but if you don't use it, you lose it! I had no one to speak to. I'm Italian but my mom didn't speak it. My dad did but he died during my second year of college and the desire to practice it more didn't come until I was a bit older. Mayuko, I can't find this story on the internet at the moment but I think I remember he had just come from a park where they had some. They had them in the pond in Boston Commons too, when I was a kid. Honestly, making a fool of myself in a non English speaking country was really no different than me making a fool of myself regularly in this country! @fred@12:50, where have I been? Well I was in Taiwan for a couple of weeks and that was a blast but other than that I think I’m usually here...? Oh and last week family was visiting. Usually I hit the archives if I miss it live. Still trying to finish listening to the Joe McG guest star show from like a month ago! @fred I think Japanese doesn't have much of anything complicated to pronounce though! I love languages but I often freeze up while speaking English much less trying Russian or Spanish or whatever. Chinese in Taiwan was the worst. I tried to learn a few phrases and could barely even do that. They were especially hard to remember for some reason. @Dropof Yes, actually, it's easy to forget that there are many things that one wouldn't understand anyway even if it was explained in their mother tongue. @Ike Literally everything I said in my attempts of pronouncing Chinese in Hong Kong never made nowhere. Not even one "excuse me" worked. Chinese too hard!!! Good thing that music has a common language. Hola rbrt! Bienvenido a mi radio! Right, but Thai is also tonal and I didn’t have as much trouble learning a few phrases there, or remembering them, but maybe their tones aren’t as heavily implemented. Or maybe they just have so many tourists that they’re more used to visitors massacring their language. That’s probably it. @Mayuko, oh wow, good to know I’m not the only one! I'm worst in English speaking countries like Scotland where I try to "fit in". Usually when I watch a Japanese movie without subs, I understand parts of it but other parts are foggy. I kind of enjoy that feeling -- it reminds me of watching movies when I was five or six years old. Maybe learning a foreign language is a way of feeling mentally young. Been whole floating swan peddle-boat full of fun today, Mayuko. Thank you. There's a good chance I'll be seeing you and all next week, pero tengo dudas. ¿Dos horas? ¡Adios, Señörita Mayuko! Oooh, gotta get some of those Montreal-style bagels! Have an amazing time up there! Bye Mayuko! Hear ya next week! We went to an Italian restaurant in Amsterdam many years ago. I tried my Dutch on the owner. He laughed. It was funny an Italian laughing at an Englishman in a third language. Gracias Mayuko! Hasta la vista! Oh, and the Minestrone and Pizza were first class. @fred re 2nd set I knew you were going to say that! Haha!! @Dropof I'll try my horrible attempts of greeting in French while I'm there!! Sounds like fun!! Can't wait to hear about it! Gracias everyone for listening! See you next time!!!!! !